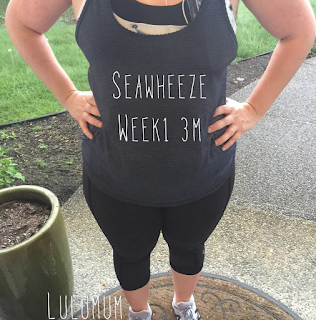 Seawheeze 2015 is just around the corner so I thought I’d share my training progress with you up until the big day in August. 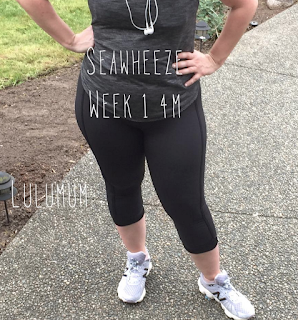 The Seawheeze training app was just released last week for both android and iphone so it is the official 12 week countdown to getting those miles in. I started getting back into running and building my 3 mile base in February (my last half marathon was in 2012) but then in April I travelled a bit and got bronchitis so I had a bit of a hiatus and loss of motivation and freak out about not being able to get this done. Thankfully I have a personal coach that is helping me (I’ll fill you in on that later) and so she’s really kept me on track and helped motivate me and really decide what my goals are, and she’s tailored a plan specific to my needs. My goal is to actually train for this, run the entire distance and feel good at the end of it and possible meet a time goal. My 2012 race was a bit of a gong show because I didn’t train for it beyond 5 miles and relied on just my crossfiting and I was able to wing 8 miles of it in great time (which was great!) and then I bombed the remaining 5. I felt so terrible after! Crossfit did help me, but you still do need to train for those other things like adapting to extended exercise in warm temperature, hydration and getting your joints prepared for that assault. Training for a half marathon this time around seems a lot more difficult to fit in despite the fact that my kids are older. I’m just overall more busy and balancing different priorities and in order to fit in run training for the next 12 weeks I also need to cut back on Crossfit a bit which I love. Oh well! It’s 12 weeks and when I cross that finish line I will be so very happy that I joined and trained. First run after hiatus in April/May and it was a terrible run. 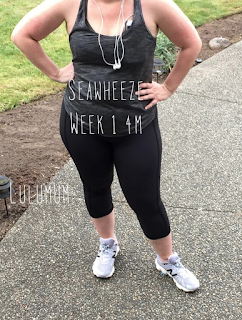 I had just started the ketogenic diet so was a bit dehydrated and my legs felt like lead immediately and I was having low back pain from my kidneys that were probably raisins. Because of my husbands work schedule my runs are not before 7pm so my route needs to be adjusted for that. I opted to run to the local track and run the remainder on the track which got very monotonous but I kept moving and got the 3 miles done. Yuck! My next run I was smarter and not only prehydrated with a ton of water, I also drank a lot of lemon water with sodium in it for the electrolytes. Still on the Keto diet so not drinking or taking in any carby foods and my body is spilling fluid a lot quicker so I have to be very mindful of electrolyte intake. This run was way, way better and I ran it pretty effortlessly. I like randomizing my routes too and just heading out in whatever direction strikes my fancy and that really helps with keeping things interesting and helping me adapt to different terrain. I use the mapmyrun app instead of my garmin because it is just as good for stats and it streamlines how much stuff I have to take with me. One thing I need to mention is how awesome the Run Stuff Your Bra and Run For Days Bras are. They hold my iphone 6 plus snugly and there is no bounce or risk of it falling out on me. Love it! Ugh! my long run! I hydrated well for this run but the route I chose was extremely hilly. I started with a long 1 mile incline, had 1 mile mostly level, a steep 600 meter hill, downhill and then a very steep 1 mile at the end. I live right next to a 176 Hectar park which I sometimes like to run the trails but we’ve had some bears spotted in my neighborhood and I noticed fresh bear warning signs up at the trail entrance so I ran the perimeter of the park instead which meant more hills. I had two more workouts this week for Crossfit but I didn’t get outfit pictures. My run outfits aren’t very interesting since I pretty much wear my Run For Days Crops, Run Stuff Your Bra or Run For Days Bra and whatever tank. I’ll try to keep it interesting but I don’t have the same zest for running outfits that I do for Crossfit. lol! I guess because it is a solo sport and my main goal is to endure. I'm following along using the app to mark down runs and weeks but I'm using my trainers prescribed runs. I think she has me doing speed work next week. That is awesome Lulumum! I will try the Run Stuff your bra. what kind of tops do you usually wear with this bra? I like wearing the Swiftlys on my run (training for a half marathon, too…my first one), and the tops usually come up too high to access my phone, etc. I usually stuff my iphone in my speed short pocket. Don't have to deal with wires or cords because I use wireless earbuds. Cool Racerbacks and 105F singlets seem to be my most worn. I have 1 swiftly SL but I don't wear it that often – I should try a run with it and see how it is. Nice job getting back into the running game LLM. Please keep us updated with these kinds of posts. I find it interesting and I can run vicariously through you, lol. I just finished my last half marathon for the summer (live in FL so our race season is over!) on Sunday, so I know what you're about to take on. I'll be cheering for you! Thank you! I definitely will! I'll do a weekly update post with pictures and how it's going. I'll also do a race and expo report. Fantastic Lulumum! Thanks for the update. I am not a runner, but I like to hear about the training and the preparation for the half marathon. Like Samantha, I will also run vicariously through you. Good luck! I'll be cheering for you!